Houseplants can be an important Feng Shui tool to help activate positive energy in your home or office while they purify the air. Many people think that lucky bamboo is the only Feng Shui friendly houseplant, but there are actually many choices that can fit your décor. The best time to add a new plant is at the beginning of a new month or at the new year, when it symbolizes a healthy beginning for you and your family. If your light is too limited to grow healthy plants, or if you simply have a case of “brown thumb, ” silk plants are an acceptable Feng Shui alternative to living plants. Be sure to dust them often and replace them if they fade. However, it's best to avoid dried flowers because they represent stagnant energy. If you simply can’t give up your dried arrangements, be sure to dust them frequently and replace them seasonally. Counteract Negative Energy. Locate a plant within three feet of your computer to filter electromagnetic energy. Connect with the Outside World. Plants soften the straight lines and angles in your home or office and simulate the feeling of being in nature, where everything curves and flows. Choose plants with round leaves rather than those with spikes or thorns. Raise a Low Ceiling. Place tall plants in the corners of rooms with sloped ceilings or heavy exposed beams to help offset symbolic heaviness. Balance the Water Element. Use plants in bathrooms and laundry areas to symbolically “dry up” excess water and balance the room. 1. Philodendron. This plant grow well under natural and artificial light and its heart-shaped leaves represent the Fire element that can add emotion to a dark or cold area or your home. 2. Peace Lily. This plant grows well under artificial light and produces white flowers, making it ideal for office settings as well as your home. 3. Ficus. A large Ficus can serve as a room divider or symbolically lift a low ceiling. 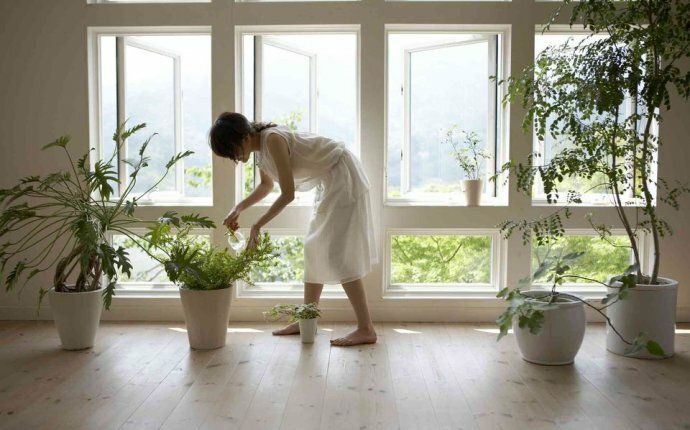 This plant can also help remove formaldehyde, benzene, and ammonia from the air. 4. Palm. Palms are ideal to create a room divider, especially when placed in a colorful planter to activate any missing Feng Shui Elements in a room. Palms remove xylene and formaldehyde from carpeting. 5. Rubber Plant. Rubber plants are especially auspicious when placed in the “Wealth Area” of your home because the round leaves symbolize good fortune, abundance, and wealth. 6. English Ivy. Trailing vines of ivy help soften any "poison arrows" that point at you where you sleep or work. Ivy removes benzene found in plastics, and helps control formaldehyde from carpets and paint. 7. Boston Fern. Use this hanging plant to fill up a corner or as a welcoming greeter at the entrance to a home. 8. Spider Plant. This hanging plant filters carbon monoxide, formaldehyde and xylene, especially when placed near a fireplace or wood stove. 9. African Violet. The rounded leaves of this plant resemble coins and therefore symbolize wealth, and is best placed in the Wealth Area. Whichever plants you prefer, choose lush, healthy plants and remember to quickly remove dying plants or they will generate negative energy. - What Feng Shui Means?